Article from the De La Salle Scout Unit Magazine, 1976. What can you do to continue the tradition of Scouting? In scouting, have you considered where we have been and where we are going? Scouting has gone through a very big change in the last few years. How are we coping with this change as youth today expect more than we did by way of activities and facilities? It’s not so long ago since there was no TV, to go the cinema was a treat, but things have changed for the better, but it is important that all of us appreciate it. Scouting has also changed. 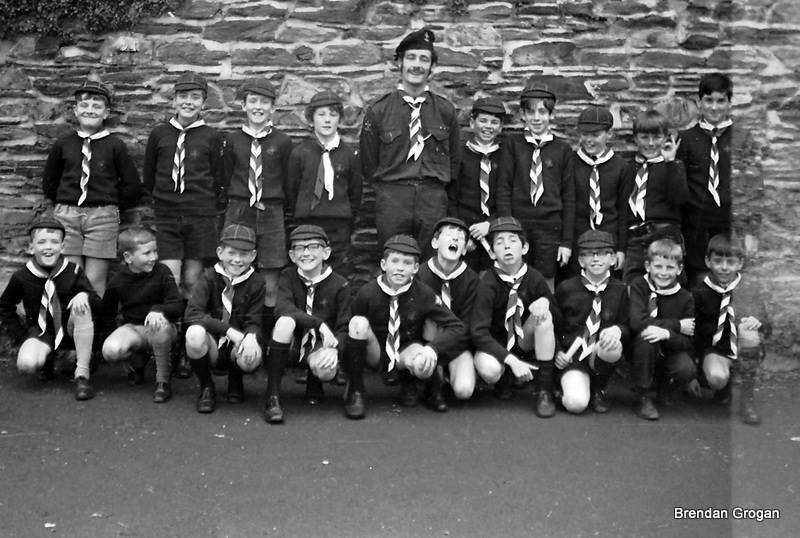 It is only a short time since we had the old Wooden Den, three scout troops with 32 boys in each and the faithful Pipe Band. At that time the approximate number of the Unit was around 100 in all. Today we have increased, we now have three troops, two Macoimh packs, the Pipe Band and a Senior Patrol Leaders group. We now have in the unit, groups covering all ages. 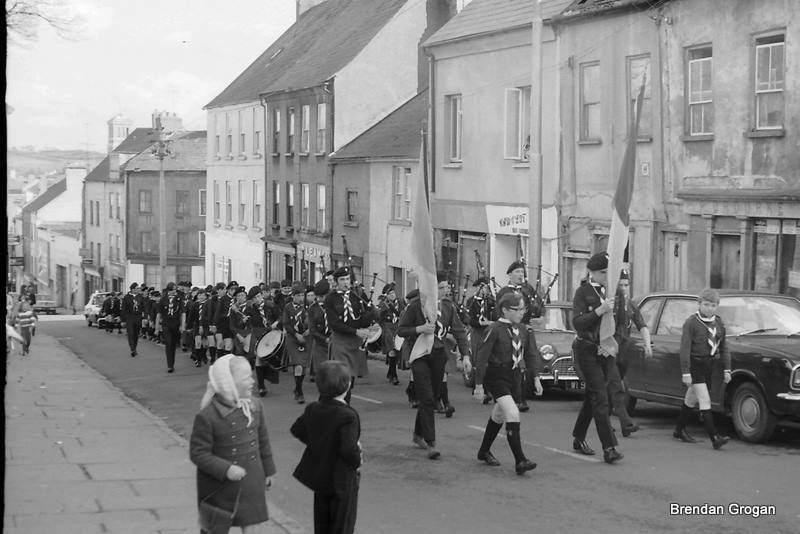 De La Salle Scout Unit returning from Parade, on Patrick Street June 1971, headed by the Pipe Band….. 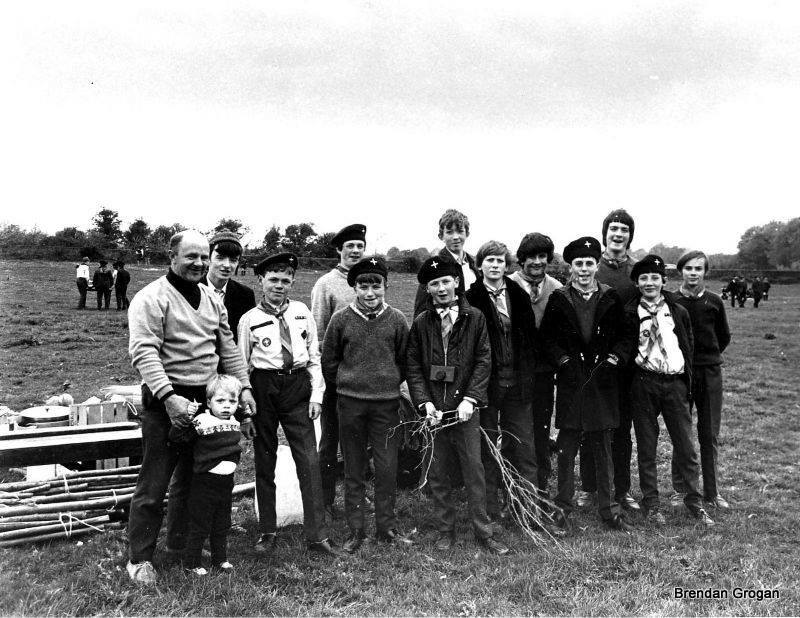 The Macoimh cater from the age of 8 yrs to 11 yrs and the scouts from 11yrs to 16yrs. Shortly before 16yrs the Senior Patrol Leader’s Group and the Band are available to boys. During this period if lads show the interest they can go on to become leaders and at a later stage they can join the committee, so from the above you can see one can be involved from 8 yrs to 90 yrs. The number now is around 200 in the unit. 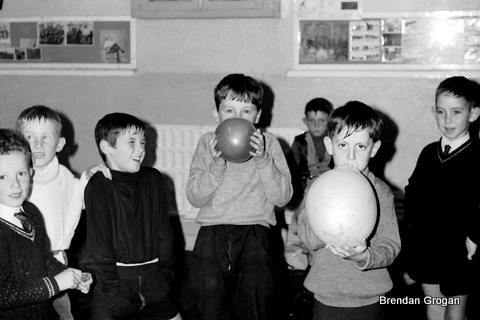 Baloon bursting competition, 3rd Macaoimh Halloween party 1970.. 3rd from left, Jimmy Farrell, others yet to claim their place in the hall of fame…. The scout hall is only a few years old, we also have a meeting room and a large store for equipment. The scout hall is in use six nights of the week between Scouts, Macoimh and Band. The latest addition is the new hall in Faithlegg which has a long story to it. 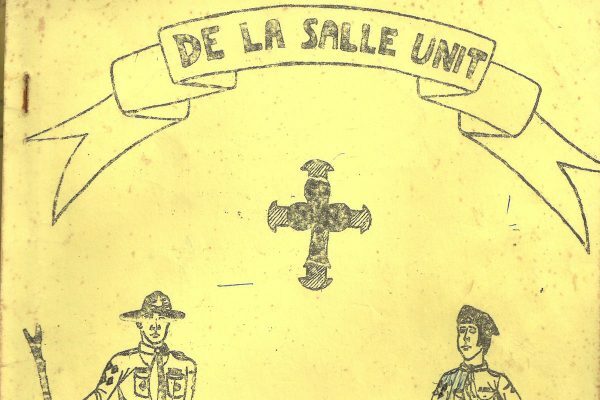 Some three to four years ago, the De La Salle Order decided to sell the College and grounds. This created a problem as the unit had used the grounds with the kind permission of the Brothers in charge and if the sale went through we would not have any grounds to hike and camp and this is vital to scouting. 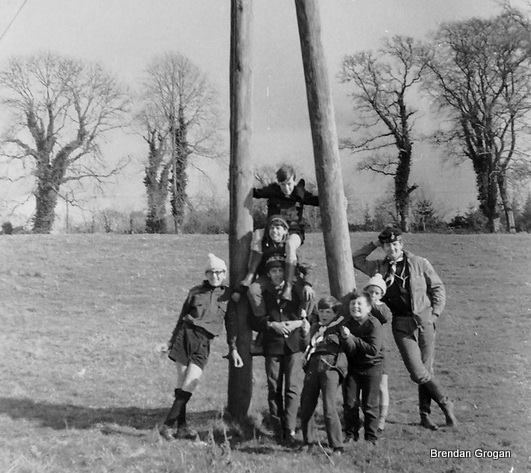 Diocesan weekend camp at Faithlegg 1970, 15th Sacred Heart unit delegation. So at this point in time it was decided to buy a small field for use by the unit. We needed a place for Macoimh to use as they are not allowed under canvas. We then bought the old offices from the Glenville Estate. These were erected but a freak storm in January of two years ago destroyed it. This was a very big set back as a lot of hard work went into it. Shortly after that mishap we began to build the New Hall which is now nearly completed and it is the result of nearly two years hard work by a handful of people. This and money being the main reason it has taken two years. While all this work was going on in Faithlegg, the Scout Hall has been left fall into poor repair as a result the roof is taking water and a large part of the ceiling is damaged and will have to be replaced. The wall and wood work could do with a dab of paint. So you can see there are some problems and some work to be done but with some team spirit these can be overcome. The main problems now facing the Unit are to finish Faithlegg, work wise and it’s very important to clear the debt of this big undertaking; to bring the Scout Hall up to a good state of repair and also to improve the standard of Scouting in the Unit. 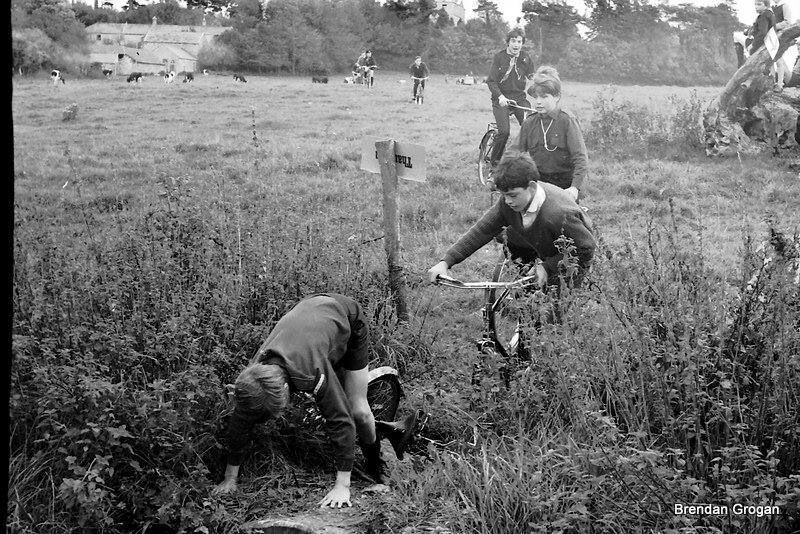 Archive picture May 1970 at Faithlegg…. Work is in hand to try to clear the debt of Faithlegg and complete the work. The standard of Scouting in the unit can only be improved if the leaders are prepared to put their shoulders to the wheel and not wait for somebody else to do their work for them. Try to encourage boys of the right age to stay in Scouting thus helping the shortage of leaders. The problem of the Scout Hall is one which you the parents can help with. The problem of trying to organise voluntary labour is a big one as many of you have the problem of maintaining your own homes and any free time is spent with the kids. I propose to set up a fund to maintain the Scout Hall and got a painting contractor in to do the work in the daytime because the Hall is in use six nights of the week. This fund could be called “The Parent’s Fund” and if the parents of each Scout and Macoimh in the unit contribute £2.00 per annum to the fund we should have sufficient to keep the Hall in good repair. Would all parents interested in this fund, and I would hope there would be many, contact me and I will set it up . This will help us to keep the Scout Hall in good repair and allow Scouting to progress in good clean surroundings as it should. The Lion Patrol 7th Troop in the scout hall doing test work. Seamus Quilty, Padraig Forristal, Frank Grogan, Ben Furlong, David Brazil. In conclusion, may I point out that all of the work done to date in the unit has been done by voluntary labour. You the parents have up to now supported us in a lot of ways and we now are asking for further help. I hope you will respond to this appeal. 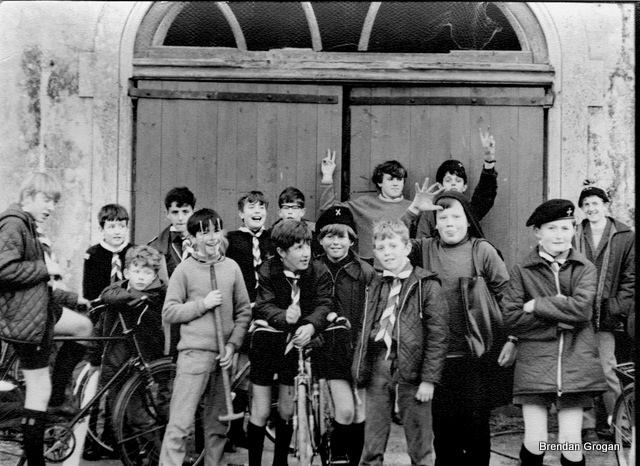 Liam Butler with a group of macaoimh, 3rd troop I think, c. 1969…..
All photos with thanks to Brendan Grogan. 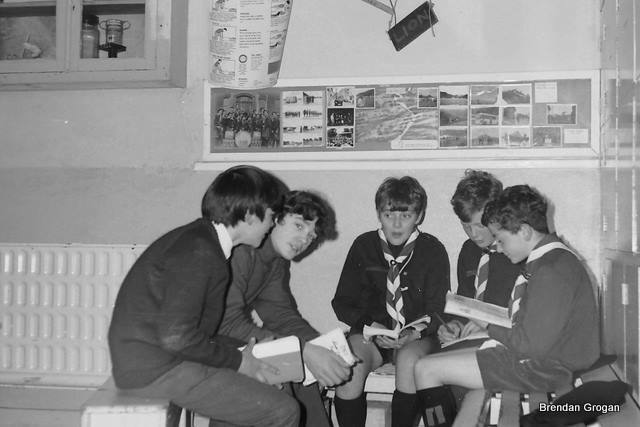 The De La Salle Scout Group 1976 magazine article is from the archives of Aidan Ennis.